Sure, eating chicken soup has been clinically proven to alleviate the symptoms of cold and flu. And even if you're not sick, eating chicken soup on a cold day just makes you feel good. But the time and effort required to make chicken stock from scratch and simmer a vat of soup makes old-fashioned chicken soup more of a long weekend project than a quick weeknight dinner. So here are eight speedy variations on chicken soup — some with meat, some without — that can be ready to serve in half an hour, more or less. The secret, of course, is using stock (and yes, you can go with vegetarian stock instead of chicken) that's ready to go, either homemade or with a packaged stock you like. Add salt and pepper to taste, simmer as directed, and serve. #(clear n1). Chicken soup with wild rice and mushrooms. Back in my 20s, I slung many a hamburger at the Jarrettown Hotel. This is a variation of a soup that Peter Elias, the chef there at the time, used to make. #(clear n2). Chicken tortellini soup. My daughters call this “mommy soup.” Actually, it’s a variation on a recipe my mom gave me about 10 years ago, which I think came off a package of frozen tortellini. It called for frozen spinach and canned broth and was exactly what a hungry and busy graduate student needed either to feed herself for a week or a suppertime crowd of hungry fellow students. Since then, it's evolved a bit to include fresh, organic ingredients, but it's still a crowd-pleaser, especially among the 9-year-old set. #(clear n3). Chicken orzo soup. Why make plain old chicken-noodle soup when you can make the fancier-sounding chicken-orzo soup instead? I love the feel of orzo in this soup — such perfect little pasta. Much less messy to slurp up, too, than long egg noodles. #(clear n4). Chicken soup with dumplings. This is a sentimental favorite — my mother used to make soup this way when I was little. These days she makes her dumplings with boxed mix, which is faster, but the old-fashioned way is comforting. #(clear n5). [%image reference-image float='clear right' width=350 caption="Italian wedding soup is like a minestrone with meatballs."] 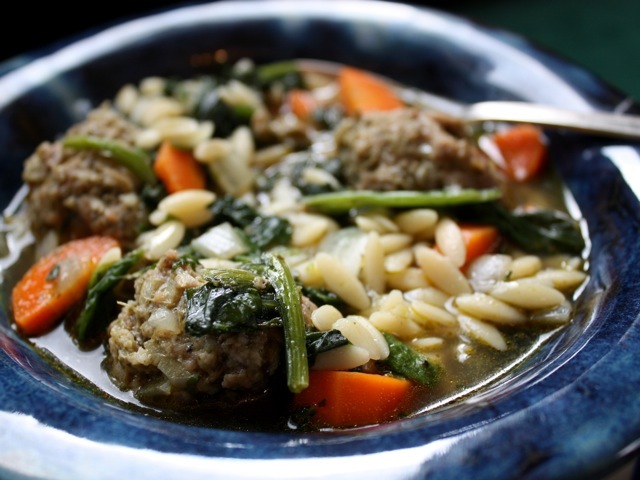 Italian wedding soup. Legend has it that the name “Italian wedding soup” is a misinterpretation of minestra maritata ("married soup"), which refers to the combination of meat and greens. I’ve seen recipes for this soup that use beef and chicken meatballs and even sausage, and recipes with or without pasta. This one uses ground-turkey meatballs made with pesto, as well as the tiny pasta known as pastina. For a similar soup that combines Asian and Mexican influences, try Chicken Meatball Soup. #(clear n6). Chicken fajita soup. This is probably the most complicated of all these recipes in terms of slicing and spicing. But chopping veggies is a great way to unwind at the end of a long day, and the taste is worth it. The first time I tried this soup, my twin daughters had just been born. A neighbor's mom made us a pot of it and delivered it, steaming, to our door. Nursing and caring for two infants, I was grateful just to have something edible in front of me — and it tasted so good, I had to sit down and savor it. We've since moved and I've lost the recipe, so this is my attempt at recreating it. Still, I never eat this soup without thinking of Martha's mom. #(clear n7). Easy tom kha gai. A spicy, coconutty, milky Asian version of chicken soup. For a similar take on this classic Thai soup, try Coconut Curry Soup. #(clear n8). Matzo-ball soup. The Jewish classic, traditionally served at Passover but also delicious on any cold, rainy day. If you don't feel like making the matzo-ball dumplings, substitute dried egg noodles instead. With cake for him and soup for me! p(bio). Zanne Miller is a writer based in Eugene, Oregon.